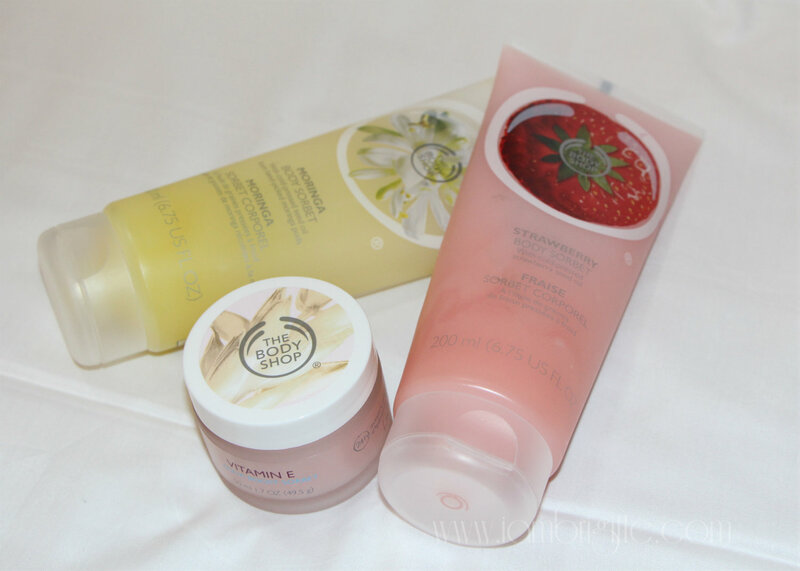 IAMBRIGITTE : Beat The Summer Heat With The Body Shop Body Sorbets! July is almost over and in a week, so is Ramadan. For those wondering how is it to live in a Muslim country during Ramadan, it's not really difficult. You just can't do your usual munching and drinking while at your desk, and it's not really because it's forbidden, but it's more like about respect. Our Muslim brothers and sisters refrain from any food and drink from just before dawn until sunset and I think this year, their fasting takes about 20hrs a day because it's summer time. Yes, they can be used to it already but still, they would appreciate if people around them won't be tempting them with food or drinks. In our office, most of my team mates are Muslims but they told me I can eat/drink as long as I keep it discreet. Maybe they know I am usually stuck at my desk and they notice that I hardly go down to our pantry to eat or drink. Anyway, I wish I can say the same thing for summer…I mean, that it's gonna end soon. It's so freaking humid here and the average temperature is what, 43C? Work hours is lessened by two hours during Ramadan, but instead of going home at 4, I still go home at 6 because it's like there's a tambutso (engine exhaust) pointed at your face when you go out. As in super init! The sun's still up even at past 7pm and the heat feels like it's piercing through the skin. So when I get home, I want to jump right into the shower to cool off. But of course I can't, mapapasma ako. Sorry, I'll update this post once I get a proper translation of pasma in English. But basically, when you're body is tired, you need to give it a rest first before you get it wet or else, you'll get sick. It's also called pasma when your hands are always sweaty and when they shake…well, at least that's what I know about it. Tee-hee! Scoop an industry first with these cool body moisturizers infused with your favourite scents! Our breakthrough sorbet texture instantly melts into skin for a frosty burst of fresh moisture, keeping you hydrated without the sticky feeling. Made with 100% organic community fair trade Aloe Vera from Guatemala to comfort, cool and soothe thirsty skin. I'm not so sure if these body sorbets are a new invention but this is the first time I got to try something like this. I've tried some cooling lotions in the past but the cooling sensation is mainly because of menthol in it. In these body sorbets, it's because of the Aloe Vera content. 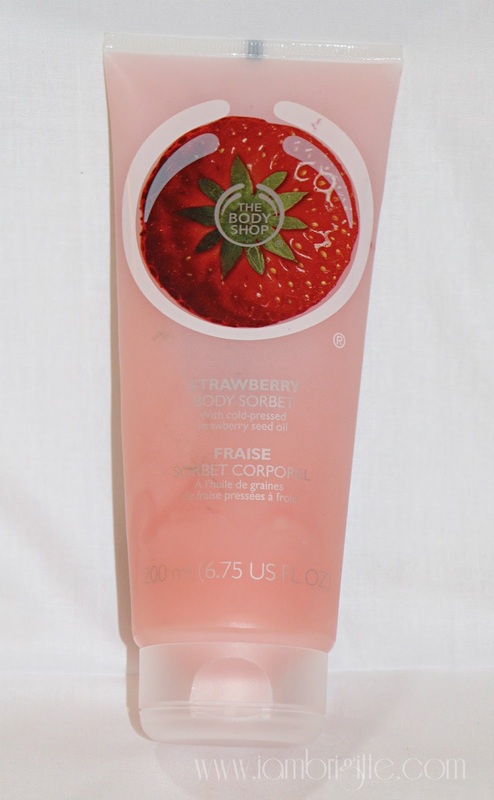 The Body Shop's Body Sorbets are available in Strawberry, Mango, Moringa, Pink Grapefruit and Satsuma. Our friends from The Body Shop sent me two (Strawberry and Moringa) and also their Vitamin E Aqua Boost (which I'll be telling you about later) to try. I love how this smells so delicate and fresh. 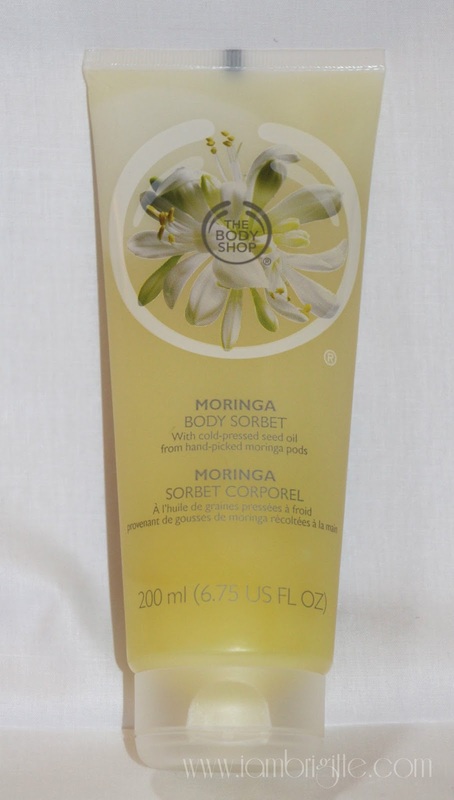 I used to have a Moringa room spray and I use it to calm my nerves by spraying it all over my room before I go to bed. I actually associate its scent to a day spa. This one I use at night after I shower. This smells so delicious and it reminds me of my favourite chewable candy, Fruitella. Whenever I use this, I get so tempted to taste it! Maybe I will, soon. If you haven't heard from me for say, months, then you know what happened. Hahaa! Kidding. Anyway, this one I use in the morning to help me become more awake. It's a very good pick-me-upper on days that a shower isn't good enough in the morning. These body sorbets spreads very easily onto the skin. There's also a bit of granular feel to it that is also easily absorbed by the skin. It feels cool, but not so much so what I do is I pop it inside the fridge for a few minutes. It feels wet when you apply it but it dries off to a powder-like feel so there is zero stickiness. The thing that most impressed me however is the level of moisturization it provides. I apply the Moringa variant at night and still wake up with soft, moisturised skin in the morning. Take note that I have my AC on full blast the whole night. And as for the scent, I can still smell a bit of Moringa when I wake up. I wish it comes with an SPF so I can just wear it alone during the day. I use the Strawberry variant after shower in the morning but I still apply sunblock before I go out. Too bad, I want people to have a sniff of fresh strawberries as I walk past them! Hahaa! They look so good, I want to eat them. GAAAH! An instant cooling sensation for all day hydration. This silky-soft moisturizer hydrates and refreshes skin with an ultra-light formula. It quenches skin's thirst, feels like a burst of freshness on skin and is enriched with wheatgerm oil. This could be a great day time moisturizer, if only I'm not trying to stay away with anything with Vitamin E. Sniff. Yes my loves, me and Vitamin E don't go well. I remember applying Vitamin E oil in the past and waking up with itchiness all over my face and then followed by a horrible breakout. I opted for oral Vitamin E and same thing, I broke out. I really want to give this baby a try because well, Vitamin E is good for the skin. And I feel like my skin needs all the moisture it needs most especially when I'm at work when the AC is on full blast directly on me. Maybe this is what I need during the day. But I guess I need to hold off for now since my skin is still recovering from the cystic acne caused by a recent trip to a facial center. Sniff. But I've read a lot of good reviews about this product. 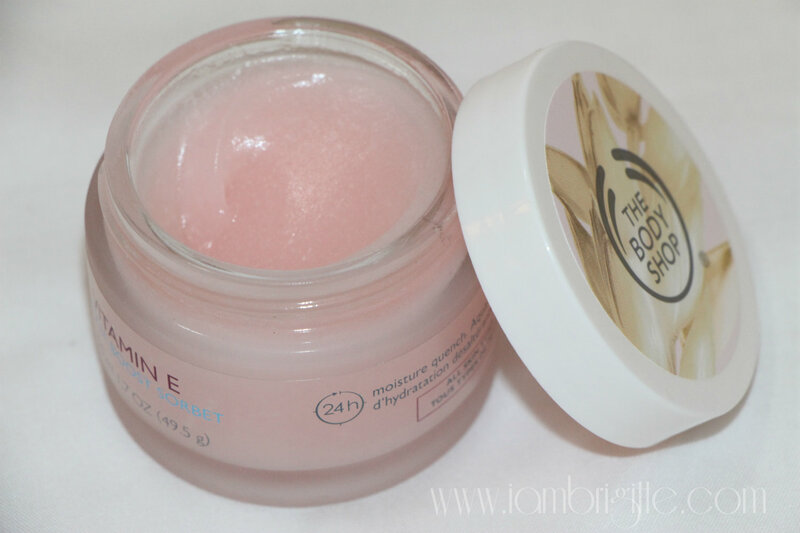 So if your skin loves Vitamin E, then you might want to give this product a try. It's a must have this summer! For the prices, the press release sent to me doesn't have information but I'll update this post once I have it. I will drop by a TBS store soon because I would like to check out the other body sorbet variants!